sheep and no city: Glottens? Thank you all for your support on my relaxing weekend. It worked! The weather, though, let's not talk about the weather. I had been slightly interested to see the landscape, maybe even go for some hiking.. [cough] but there was no way to leave the house. Snow, rain, icy rain - you name it - horizontal, vertical.. uhh! But this is were the 'jacuzzi' thing comes into the game. Almost every Icelandic summerhouse has one (specially in geothermal areas of course). We boldly stripped naked on the patio at least twice a day, tip-toed through the snow and layed simmering in the hot water. And now the knitting part. Call me insane but I took four projects with me (for two days!). Moreover, I also had a skein of Noro Kureyon with me, with the intention to work out something in order to have warm hands and peaceful palms. Pretty, precious Noro. 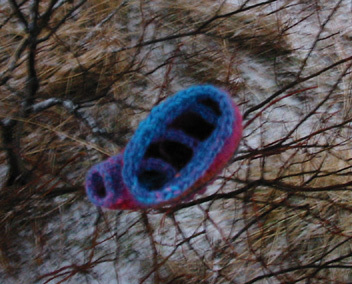 I casted on for some glove/mittens = glottens and hardly touched any other knitting. But I am so pleased with this project. I was even more impressed by my efficiency. Look! Afraid to run out of yarn, I spared the thumbs for last to fit their lengths according to the left overs. 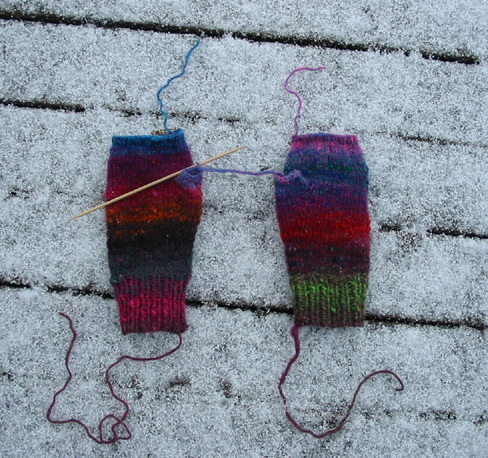 The finished gloves are just the size I wanted them to be and I had 10 cm left. na.. not really left. It left me with the tedious (but fast!) job of weaving in a 5cm thread. Very satisfying. They are basically gloves without fingers. I wanted however something more closed then just open mittens - I always feel a little naked (and cold) between the fingers. On the other hand, I was too lazy to knit short fingers. 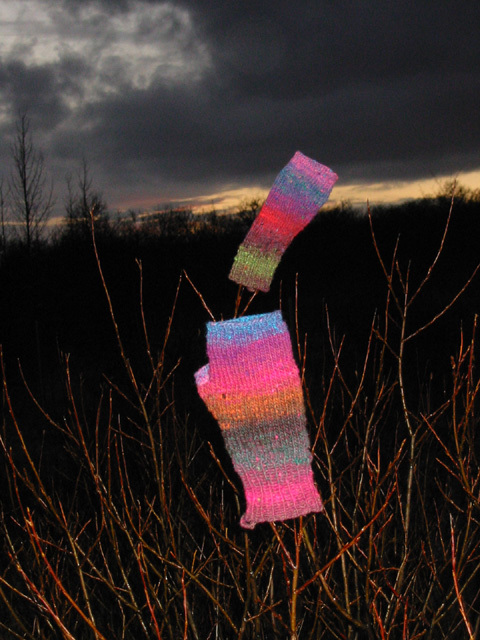 Yes, mainly too lazy, but I also assumed it would look and feel a bit clumsy with the thick Noro yarn anyway. So here my idea: I crocheted little bridges between the fingers. Really cool, it turned out excactly how I imagined it. What a delight. by Carola at 8:18 e.h.
Those look great! And what a great idea for the bridges between the fingers. I bet that makes them feel much snugger. nóvember 22, 2005 2:07 f.h. nóvember 22, 2005 2:09 f.h. I still need to get moving on my gloves. Its not cold enough here to feel the need unfortunately. I will have to experience winter via your blog! nóvember 22, 2005 6:37 f.h. That's exactly what I did a couple of months ago, crochet between the fingers. It brings the mitts together and provides that lovely closed feeling whilst still giving you all the movement of fingers doesn't it? nóvember 22, 2005 9:48 f.h. i've decided that you icelanders are insane! i would need to wear my thermals just to get to the hot tub....what's all this stripping naked stuff about. nóvember 22, 2005 10:40 f.h. That's what Finnish people do too, right? Sauna naked whilst it's freezing cold outside? I remember my Finnish friend telling me that. The glove/mittens turned out well. 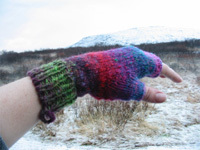 I would really just call them fingerless mittens. Glottens sounds like gluttinous to me, but that's just me. I like the idea of the crocheted bridges. I just have no idea of how to crochet, or how that would even happen, where you would start the crocheting, but it does look great. Your hands will be very warm and I'm glad you had a good weekend. nóvember 22, 2005 4:21 e.h.
Beautiful glove/mittens with Noro! I don't know about running naked in the snow to the jacuzzi, though...I like the cold weather, but I need to have clothes on! nóvember 22, 2005 6:00 e.h.
Those are so cool! Are you going to publish the pattern? nóvember 22, 2005 11:11 e.h.
i love your glottens! what a clever idea to crochet the bridge...they must hug your fingers better than just fingerless gloves. now you're giving me ideas and i don't need another project! nóvember 23, 2005 2:49 e.h.